I am continuously delighted by my girls. It's amazing what they can do when they put their minds to it. As a Venture Scouts project, Younger Daughter was required to pull together a meeting that reflected a hobby. She decided to put on a writer's workshop since she has a passionate interest in writing. 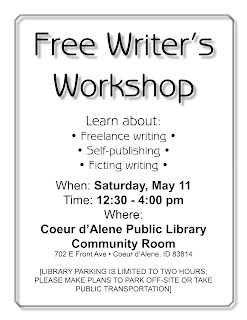 All by herself she contacted the Idaho Writer's League and presented her idea, and asked if anyone was willing to donate their time to this project. 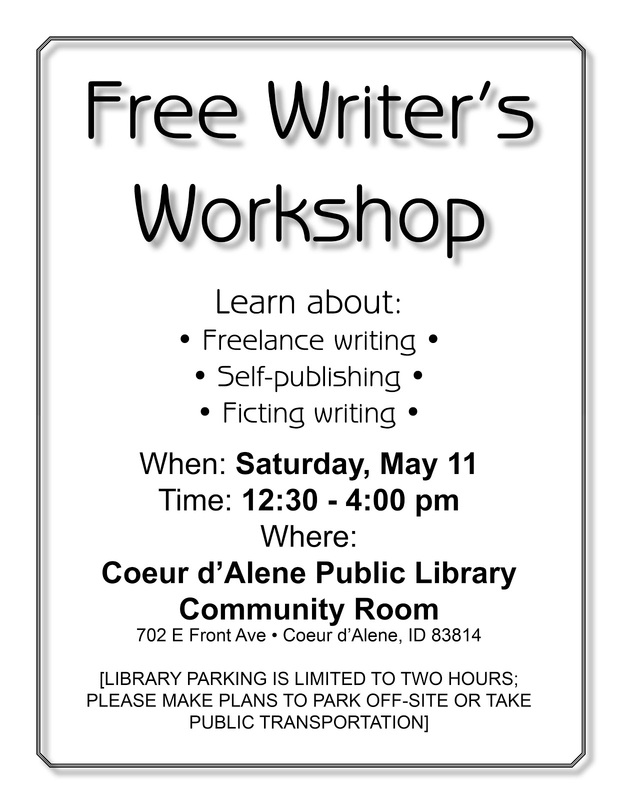 The IWL chapter president kindly passed this request on to the members, and Younger Daughter was blitzed with offers from writers generously willing to participate by giving a workshop. She contacted the Coeur d'Alene public library about a meeting room, set a date, signed the required contracts (which I co-signed since she's a minor) and even paid the cleaning fee out of her own pocket, as was required by contract since she offered refreshments. The library's meeting room is only available for four hours on Saturdays, so Younger Daughter had to limit the number of workshop to three. In order to present as broad a spectrum of subjects as possible, she selected three writers (myself included) to give seminars on freelance writing, self-publishing, and fiction writing. She kept in touch with her speakers and, as the day grew closer, she pulled together an advertisement (which I mocked up for her). She then sent this to local colleges, vocational schools, high schools, coffee shops, and placed the information in the Coeur d'Alene Press. Attendance was modest (five people), but all five people were eager to learn, attentive to the speakers, full of excellent questions, and went home very very satisfied. Younger Daughter welcomed the attendees to the workshop, introduced each speaker, thanked both the attendees and the speakers afterward, and followed up with thank-you notes to those who had helped her out. This project was on par with Older Daughter's Venture Scouts project last November, which was to put on a music recital in a nursing care facility. I'm so proud of my girls for having the gumption to pull together these kinds of activities. I would have bumped the attendance to 6, except I work those hours. She did an wonderful job organizing. I know adults who could not have pulled together such an event, let alone attended to every detail. Great job! Holy Moly - THAT'S impressive! Don't know if I would have the gumption for such a project and I'm a fully grown adult! How cool is that! What an awesome skill your daughter just learned! I'd have been very interested in a workshop like that and I'm sure those attendees learned a lot. You and Don must be so proud of your girls! What a great experience for all. The topper was sending the thank you notes! Wow! Congratulations to YD. Very impressive! Your girls are awesomely resourceful, just like their mom! My son is an Eagle Scout and my younger daughter, 11 years old, has expressed an interest in joining Venture Scouts. I am hesitant, with all the mess in Scouting with homosexuals and such. If possible, I'd like to pick your brain about your take on the program. She has a few years to join, yet. I'm just trying to get some background as this is new to me. "Bear Poop and Applesauce" is now available!